Battleframes and melding and such. Firefall is a free to play MMO/Shooter from Red 5 Studios. Players drop into Battleframes and combat various enemies in a world set 200 years in the future after an asteroid has hit Earth. The PvE element is a huge component of this game, so here's what you can do. How many players can play Firefall locally (couch co-op)? How many players can play Firefall via system link or LAN? How many players can play Firefall online? 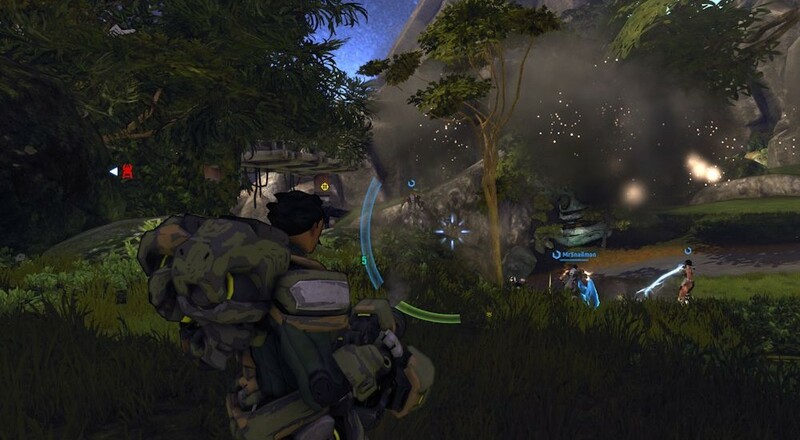 How do you begin a co-op session in Firefall? How does character progress work for co-op play in Firefall? Can I join a game if the host is further along than me in Firefall? Can I trade items with other players? What's the first thing I should do in Firefall? What do I have to pay for in Firefall? I still can't seem to buy everything in the stores. What other currency do I need for Firefall? What are Battleframes and how do they work for co-op in Firefall? When is Firefall out of Beta? None. Firefall is an online MMO. As Firefall is an MMO, it's technically unlimited. That said a co-op squad is currently limited to 5 players while an army can have up to 20 players in it. Squads are used for completing missions while an army is for larger more persistent scenarios. Technically the game is "always" co-op. But there are a few different scenarios. If you want to create a squad bring up your menu (default is ` key) and select social, squads, invite to squad. If you bring up the map you can see dynamic world events and missions. These are represented by icons, hovering over them tells you what they are (Mission, Thumper missions, Melding Tornado, Incursion, etc). Simply head to that location and you'll be cooperating with other players to complete the event. Once completed you'll receive a completion screen with rewards. Players earn shared experience and loot for completing missions, objectives and kills. Loot drops are instanced to a squad, but it's FFA for picking up said loot. There's no limitation to what you can do or where you can go in the game, as long as you have the required resources. Dynamic missions can be completed as many times as you'd like. There's not currently a way to trade items directly between players. The developers have stated this may be implemented at some point in the future. Players can post items for sale in the marketplace. It's easy to get lost in the beta currently, once you complete the tutorial and are dropped in Copacabana it might be difficult to know where to go. Our advice is to head to the SIN uplink, activate it and then go kill a few enemies to get the crafting tutorial. From there the world is open to you, but work on hitting up the dynamic events and building up your character. Technically nothing. Most of the premium in game items are merely cosmetic, so you'll never have to spend Red Beans (Firefall's premium currency) on anything if you don't care how your character looks. You can also purchase pets, vehicles, and other gimmicky items if you'd like - but some are available to craft given the right resources. Crafting is another area you can spend money on. If an item takes 6 hours to craft (that's real world time) - you can pay a small amount to get the item immediately. Some items are only available from certain vendors for the award badges. Basically completing missions in an area will earn you merits which you can trade in for goods at certain vendors. Battleframes are essentially the game's class system. There are currently five main classes with numerous premium sub classes. Each class has three or more variations that can be purchased for Red Beans. Players have access to all five classes and can switch at anytime. Page created in 0.2784 seconds.